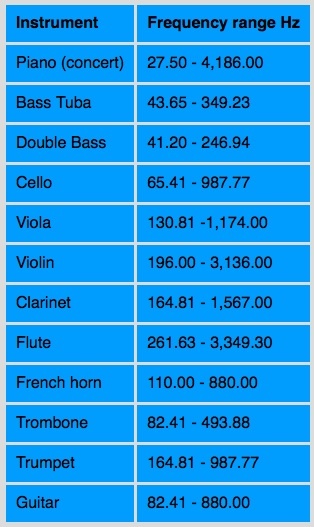 These for obvious reasons are acoustic instruments and unamplified. 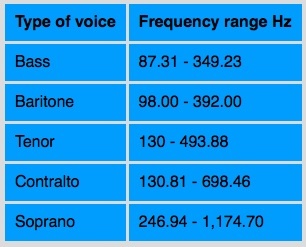 The frequency refers to fundamental tones only. To give an extreme example a massive church bell such as ‘Big Ben’ will produce low frequencies you can feel in your gut and yet the harmonics will go way beyond the range of human hearing. Interesting that a sound system will produce almost all the musical fundamentals of an orchestra without bothering the tweeter… thank Heaven for harmonics! Jet aircraft taking off – threshold of pain. 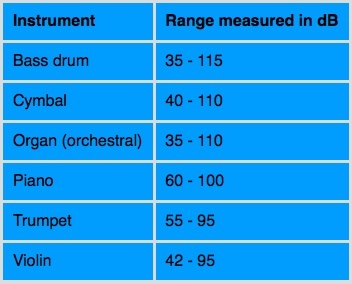 This is a guide to the sort of sound pressure levels acoustic instruments produce unamplified. No distances were given but I’d guess pretty close – a couple of metres perhaps.